We were fortunate enough to snag a FastPass+ for one of the two new rides in Pandora – Land of Avatar at Disney World’s Animal Kingdom. Nav’i River Journey is a family boat ride that goes through the underground Na’vi passages and highlights a world rarely seen by outsiders. It’s a great ride for the whole family and an excellent addition to the park. The land of Pandora is just barely six months old, so wait times for both Avatar – Flight of Passage, and Na’vi River Journey are never under an hour wait. The novelty of this land, and the unique freshness it brings to the park are not overrated. 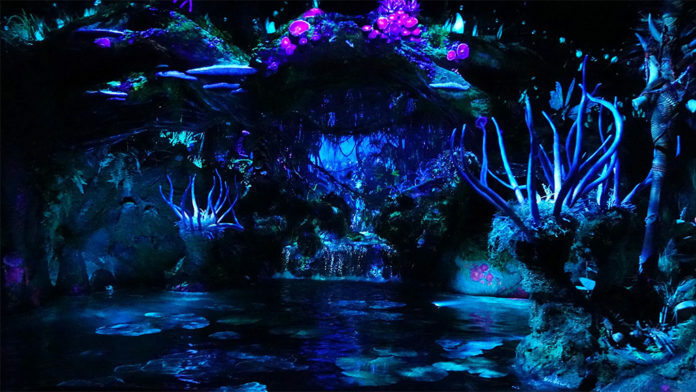 Pandora is an imaginative wonderland with floating mountains, bioluminescent plants, and new flavors, rides, characters, and more. Thank goodness we got a FastPass+ for Na’vi River Journey, because after waiting two plus hours for Avatar, we didn’t have time to do anything else. Similar to Pirates of the Caribbean, families board a boat for Na’vi River Journey in rows seating three to four people. The boats don’t carry a lot of guests, but they move along fairly quickly. 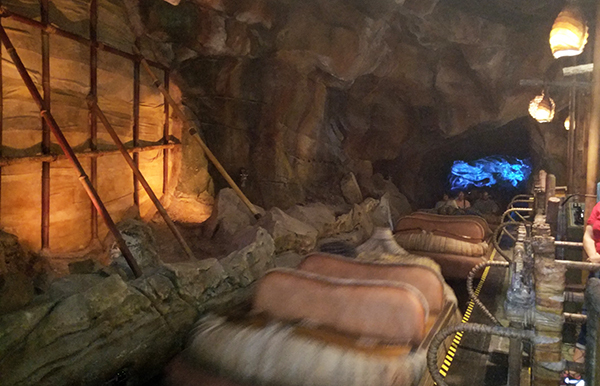 The ride travels along a river, is completely indoors, underground and dark with only the bioluminescent plants for light. We began our journey gently and softly winding through the river amazed at the incredible detail and unique offerings of not only the world of Pandora, but how Disney encompassed this incredible universe. As our journey continued, the landscape became more and more alive. We saw critters leaping across plants above our heads, we saw flowers bloom before our eyes, and we heard the chanting of the native Na’vi inside the tunnels and passageways. No detail is missed on this attraction. There is something happening every second, and in every direction. The suspension of disbelief is so real within the Na’vi Shaman, it is surreal. It’s worth the price of admission alone to see these astounding mechanics at work. ► For Kids: From our three year old to our six year olds, our children were enthralled on this ride. It wasn’t a rollercoaster, and it didn’t suspend them upside down with their hearts leaping out of their chests. This ride stimulated their imagination. It made them ask questions and want to investigate how this place was real and how the biochemistry worked. It made them want to study planets and constellations and space. Na’vi River Journey is visually and intellectually stunning. Have you visited the new Pandora? What did you think? Did you love it as much as we did, or do you prefer the more classic offerings from Disney? 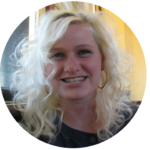 We’d love to hear all about your experience! ► Nap-Time Version: Rundown of the new Na’vi River Journey attraction in the land of Pandora – World of Avatar at Disney’s Animal Kingdom. 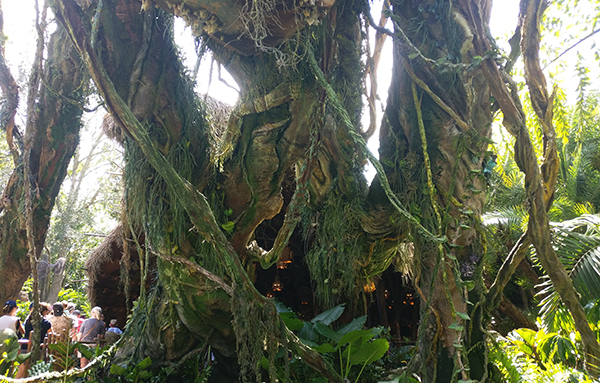 Check out our review of Avatar – Flight of Passage, the newest restaurant at Animal Kingdom in Pandora, Satu-li Canteen, and our opinion of Pandora! Just to give you an idea of how our day at Animal Kingdom went with these new attractions. We visited in September, a notoriously slow time of year to visit Walt Disney World. We headed straight for Pandora upon entering the park in the morning, used our FastPass+ for Na’vi River Journey and ate lunch at Satu-li Canteen, the newest restaurant in Pandora. 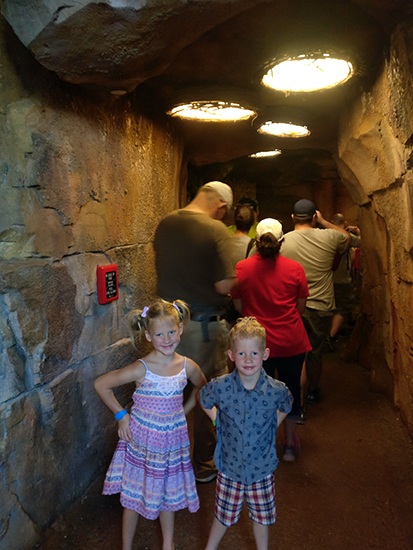 The twins and Gabriel waited in line for Avatar while I went to Dinoland U.S.A. to play with Eclair in the excavation site. 2.5 hours later, Dad and the twins went to ride Dinosaur and we met up after that to race over to Mt. Everest. We barely had enough time to make it to our dinner appointment at Tiffins. After dinner, I used our rider switch pass to ride Avatar with the twins and we hurried over to Rivers of Light. We snuck out of that crapshoot 10 minutes in, and used our rider switch pass again to ride Avatar one last time before the park closed. Long story short: Pandora will take up your entire day.